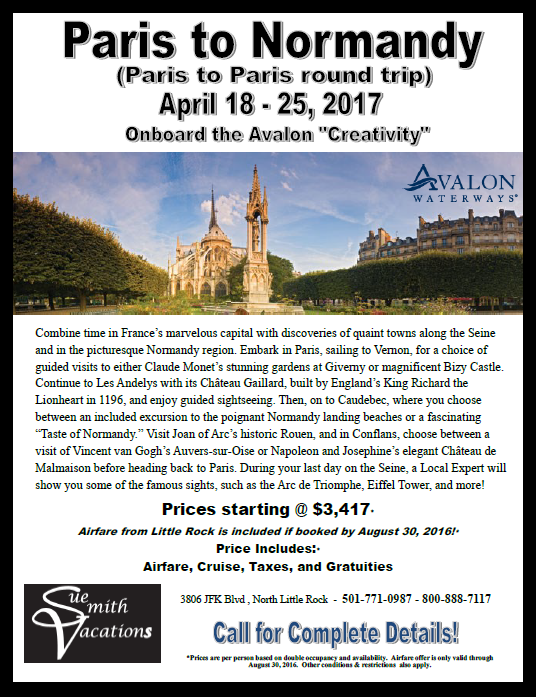 7-day Cruise Onboard the Avalon "Creativity"
Combine time in France's marvelous capital with discoveries of quaint towns along the Seine and in the picturesque Normandy region. Embark in Paris, sailing to Vernon, for a choice of guided visits to either Claude Monet's stunning gardens at Giverny or magnificent Bizy Castle. Continue to Les Andelys with its Château Gaillard, built by England's King Richard the Lionheart in 1196, and enjoy guided sightseeing. Then, on to Caudebec, where you choose between an included excursion to the poignant Normandy landing beaches or a fascinating "Taste of Normandy." Visit Joan of Arc's historic Rouen, and in Conflans, choose between a visit of Vincent van Gogh's Auvers-sur-Oise or Napoleon and Josephine's elegant Château de Malmaison before heading back to Paris. During your last day on the Seine, a local expert will show you some of the famous sights, such as the Arc de Triomphe, the Eiffel Tower, and more! *Prices are per person based on double occupancy and availability. Airfare offer is only valid through August 30, 2016. Other conditions and restrictions also apply.